After four years of Arena Scheduling at my high school, I had some serious experience designing my own schedule and customizing my education. I’d taught myself French and trigonometric functions over the summer to skip ahead. I’d gotten high school credit for apprenticing with an orchestra and performing in a professional play. I’d created an independent study for Advanced Placement 12th grade English so I could get credit for being in the Folger Shakespeare seminar for high schoolers. I was prepared to make my education my own. So I was pretty disappointed my first semester of college when I ended up with an ineffective music theory teacher, an unhelpful French professor, and a modern dance instructor who didn’t seem to notice that no one could perform her combinations. I was not going to let this happen again. For the rest of my college career, I used my mad scheduling skills to spend the first two weeks of each semester (before the add/drop period closed) trying to ferret out hidden jewels and find people who could really help me learn. It was extremely instructive. I’d thought it would be great to learn Hindi to help me with my Indian music studies, but the class I visited seemed completely ineffective. I thought Yoruba language skills would be useful for my project on Yoruba drumming, but the class did not seem to actually exist when I tried to track it down. I wanted to take a self-defense class for women, but the one offered consisted of running in laps around the gym, which was not going to give me the skills I was looking for. Instead, I ended up working with an encouraging, helpful Francophone French teacher. I found good Spanish instructors who prepared me for my trip to Cuba. I got to work with an incredible professor of eastern religion who helped me contextualize my experiences with non-Western music. My search for great classes even led me to shop at other schools in the Boston area for classes I wanted that weren’t offered at my own university. It’s true, I had an exceptionally flexible advisor! The beginning of every semester was chaotic, but definitely better than wasting my precious college credit hours in situations that weren’t going to help me learn. Whenever I heard a fellow student complaining about a poorly designed curriculum, a disinterested instructor, or a negative classroom environment, I knew it had all been worth it. Does it sound crazy to expect a 12-year old to be able to determine their requirements, decide what electives they’re going to take, fit them all into a schedule, and formulate a back-up plan (or three) in case the classes they want are full? Does it sound even crazier to release them into an entire gym full of t(w)eenage scheduling gladitors, dashing from table to table to sign up for the classes they want? Maybe, but it worked: at the unusual public school I attended from 6th to 12th grade, starting at the end of 7th grade, we all designed our own class schedule in an annual ritual called Arena Scheduling. To prepare to enter the Arena, each student would plan a schedule according to their own priorities, and also prepared a few back-up schedules in case they didn’t get their first choice of classes. After our advisors looked our plans over, we’d stand in nervy anticipation outside of the school gym, waiting for our turn to be admitted. The sooner a student was graduating, the sooner they’d be admitted into the gym to run around and write their name down for the classes they wanted. In the gym, there was a table for each subject, a piece of paper for each course offered in that subject, and a line on that paper for each spot available in that class. When it was our turn, we’d strategically dash from table to table, securing a seat in each class we wanted, or execute our back-up plan if our first-choice classes were full. I think each of us scheduling gladiators had a moments of panic. And probably everyone, at least once, was disappointed or had to make a tough decision. But even in the midst of all the dashing, no one split a lip. No one came to fisticuffs with their fellow students over the last seat in a coveted class. No one failed to graduate because they had to pick their own classes and they somehow didn’t fulfill their requirements. We learned how to go for what we really wanted. We learned how to make a plan and execute it. We learned how to activate a back-up plan if we didn’t get our first choice. We learned to advocate for our own educational goals, instead of just doing what we were told. Arena Scheduling also had the (probably unintended) effect of contributing to a culture of passion. Instead of groaning over being assigned to a challenging class, kids schemed about how they could get into one. It might sound chaotic, but I honestly think it works better than the alternative, which is having students’ schedules created by administrators—a task which cannot be enjoyable for the administrators either, and presumably takes weeks of brain-numbing planning. I’ve seen students with administrator-designed schedules have their math classes scheduled for the absolute last class period, which totally didn’t work for them. I’ve seen schools were students were only able to request a different math teacher if they had already failed a class with that teacher. In my opinion, letting students choose their own schedules is way more practical and realistic. And it empowers students to make choices that work better for everyone. 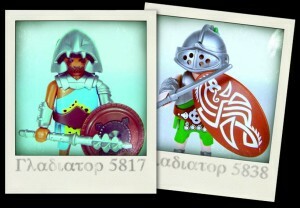 Photo credit: these great pictures of playmobil gladiators are from bloggerCosmicBaby.